A blog for us AMATEUR amateur astronomers. By @RadioVicky. I’m 33, I live in Bristol and I like astronomy. However, I don’t have a telescope and even if you did give me one, I’d be uncertain where to put my eye. I write comedy and I’m a professional blogger. My favourite colours are beer and dark skies. Telescopes scare me. Not in the way a stranger in my bedroom or a spider in my knickers would scare me, but they do fill me with a certain fear. I mean, I absolutely love things that go *shine* in the night, and have since I was a little girl, but the prospect of going out and buying a scope – something I know NOTHING about — is fairly petrifying. It even makes me feel a bit of a fraud. How can I be in to astronomy when I don’t even know my azimuth from my elbow? And also, I’m not too hot on my constellations either – sure, I know the main ones they teach you at school, but ask me to point out Lyra? Pegasus? Lucky Jim’s Pirate Ship? OK, I admit it, I’m an AMATEUR amateur astronomer, but so is 99.9999999999999999999999% (possibly more nines than that, I didn’t have time to conduct a survey) of the world’s population, so it’s a cool club to be in. But something happened this weekend that made me feel better about scope envy. I’ve been getting friendly with our very own @virtualastro on Twitter, and when I discovered I had 900 free minutes to use before the end of the month, I thought it was nigh on time we spoke to each other. So, I called him up, and we spent a total of FIVE HOURS on the phone over the course of Saturday and Sunday night. Rest assured Twitter, we have plotted and planned some very exciting things together which will be blazing your way like a comet made of ideas instead of muddy ice soon …but the best, most wonderful, amazing, magical thing we did was…GO STAR HOPPING TOGETHER. Without a freakin’ telescope! Even though we are about 70 miles apart (I live in Bristol, he lives in Oxfordish somewhere) we were both able to look up at the same sky, see the same ISS passes, and the same meteors. It was remarkable to be on the phone to someone with such an incredible knowledge of the skies. I sat gob smacked, mouth and ears open, as he talked me through constellations, clusters, satellites and gory Greek myths. I had no idea Cassiopeia had been a naughty girl and was sentenced to dangle upside down on a chair for eternity. I’d never heard of the Cygnus Rift — an ominously dark patch of sky in our milky way. I couldn’t even pick out the summer triangle, but now I know where it lives I will undoubtedly point it out to people in the pub, spilling cider as I leap around, trying to remember which stars make it up. The best part was a dazzling ISS pass with a Perseid meteor streaking past like an arrow through a love heart. @VirtualAstro even had to put the phone down to deal with the deluge of tweets, and it felt amazing to be part of something so communal, so magical, yet so fleeting. He also reassured me I didn’t need a telescope to enjoy the skies – which is fabulous because I was getting a bit sick of wishing for one on every meteor I saw. 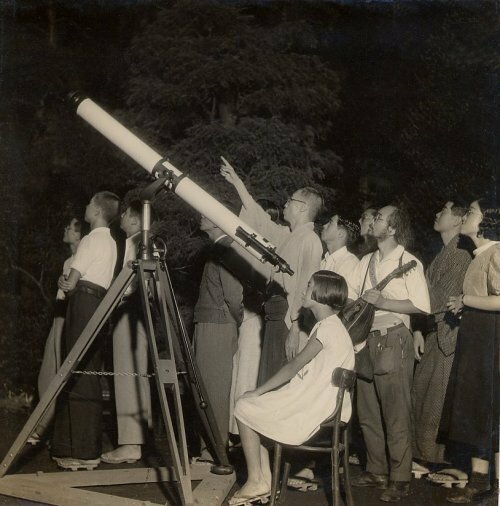 He said ‘if you look up at the sky…then you’re already an astronomer,’ a line which neatly castrated the last traces of my scope envy. As I lay back and looked at the star-flecked sky, with crickets singing in the hedge, fired up with a guided tour of our resplendent heavens, it dawned on me. This was better than any naughty phone chat line. He could quite easily wire up a premium-rate number to his phone and charge £1.50 a minute for the pleasure of his knowledge. Yep, I had a great time star-gazing without a scope last night. To the point of rubbing my thighs and drooling a bit. And how was it for you, darling? 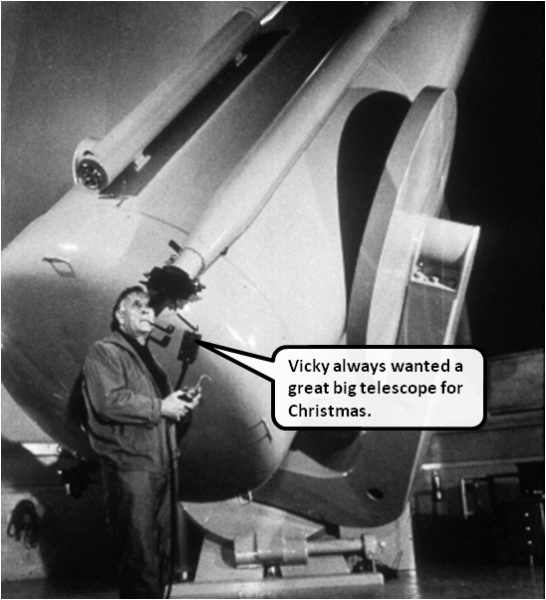 Vicky pretended she was having fun looking through the telescope, but the view was better with just her eyes. What is it? – The International Space Station or ISS is a large spacecraft which orbits around Earth. This orbit allows the ISS to be reached by launch vehicles (such as the Space Shuttle) of all the international partners for the delivery of crews and supplies. It is the largest and most complex international scientific project in history. The ISS is the size of a football pitch fitted with almost an acre of solar panels that provide electrical power to six state-of-the-art laboratories. 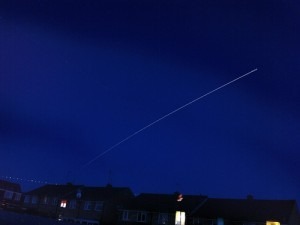 Can the ISS be seen from Earth? – Yes, it travels at an amazing 17,000 mph and orbits earth at an altitude of approximately 250 miles. The sheer size of the structure and array of solar panels reflect sunlight, making it the biggest, brightest object orbiting earth. Only the sun and moon are brighter. It can easily be seen moving across the night sky, at certain times, almost resembling a slow moving fireball. 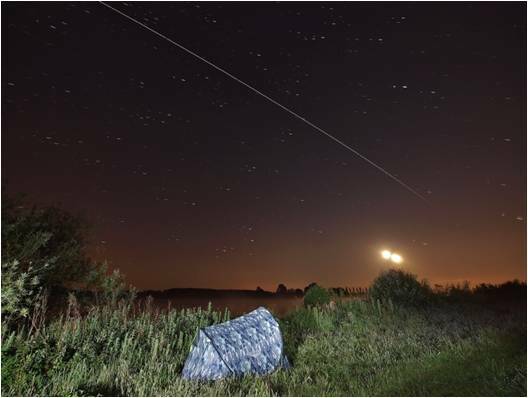 Planning – Firstly, one needs to calculate at what time the ISS will pass over the skies above. 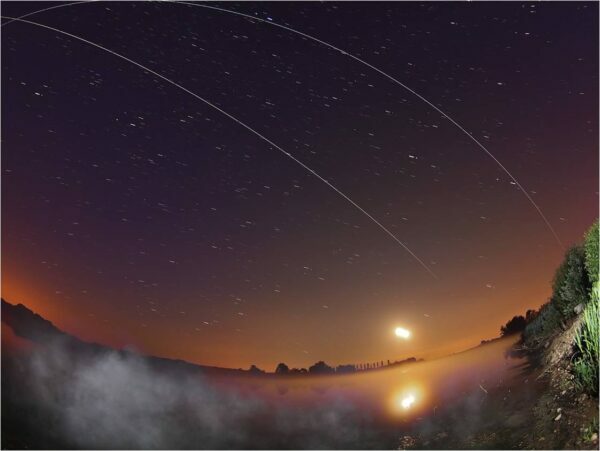 This can easily be found by visiting a website: www.heavens-above.com which will identify the exact days and times at when the ISS will pass directly above one’s location, and which part of the sky to look. There are also a number of excellent mobile applications such as ‘GoSatWatch’ and ‘Flyby’ which allow this to be done remotely. Execution – A good ISS capture will require a long exposure. A tripod is therefore required to keep the camera nice and steady. 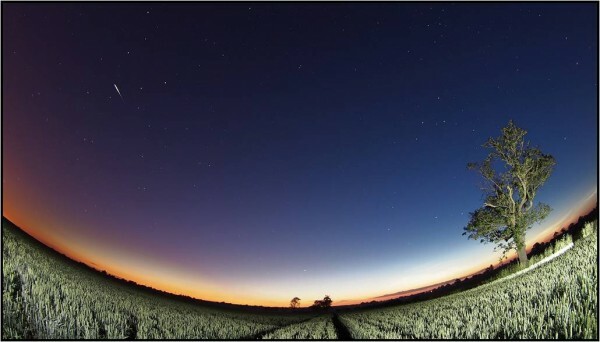 A wide angle lens will ensure maximising as much of the ISS flyby which can travel across the entire horizon. Personally, I use the Olympus 7-14mm or 8mm fisheye which are ideal lenses. Try to locate a foreground object of interest within the frame, a line of trees or buildings in order to give the image perspective and scale. Set the camera to manual and use long exposure times of anything between 15 and 30 seconds. With camera primed and in position all that is left now is to wait for the ISS to enter the field of view. By capturing a single or number of continuous exposures the resulting image(s) will reveal a long trail across the frame. Capturing numerous and continuous images will allow you to stack and produce a composite, which can produce stunning results. ISS Double flyby photo (bottom) – For this ISS double flyby image I chose a location that offered a good foreground subject (water) and scope to cover the entire east/west horizon. Planning involved choosing an evening where the ISS would fly over my location numerous times (in one night) and a look at the weather forecast to ensure clear skies. Armed with a one man tent and all my camera gear I headed off and arrived on site late evening on June 11th. The first ISS pass was due at 2300hrs and subsequent passes every 90 mins. The plan was twofold 1) Set up one camera waterside and take continuous 15sec exposures for the entire night 2) Use a second camera for each ISS pass in different locations at the site. In between passes I would grab a short power nap huddled in the tent. Not a very comfortable evening but the resulting images made up for it. Using stacking software I produced two composite images, one detailing the ISS passes alone and the other including a star trail from the entire evening. The star trails and bright light (moon) is the resulting visible effect of earth’s rotation. The location choice was also perfect as the morning mist makes for an eerie scene, perfectly complementing the ISS pass. The images made the national press the following day, which was very pleasing. One final word about capturing the ISS – it is due to be decommissioned (crashed into the sea) in 2020, so be quick! 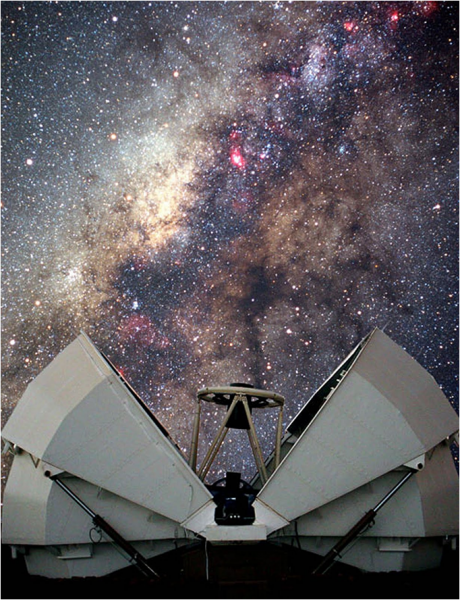 Win a chance to have Nick Howes (@NickAstronomer on twitter) equipment consultant for Astronomy now image your favorite object using the almost Hubble sized mirror of the amazing Faulkes Telescopes. One in Hawaii one in Asutralia…the choice is yours? He will even process the image and submit it to the Astronomy Now magazine gallery. For every Perseid meteor spotted and tweeted over the next two nights for the Meteor Map, each tweet will be entered into the #meteorwatch competition and the winner randomly selected. So don’t forget to tweet #meteorwatch, 1st part of your postcode, Country code and how many meteors you just saw. Meteor Watch, 2011. Well it’s that time of the year again. The air is warm, days are long, Noctilucent are departing, which can mean only one thing – Meteorwatch is back. There are many subjects within our night sky that are fascinating to watch and equally challenging to capture on camera. However, there really is something quite exciting and magical about spotting balls of fire streaking across a star filled sky. Maybe my affinity with severe weather and, in particular, lightning was the catalyst for fascination, or perhaps the fact that objects the size of a grain of sand can ironically put on such a grand fireworks display. History, in the form of a meteor shower 200 years ago is said to have inspired Samuel Taylor Coleridge’s lines from his famous poem The Rime of the Ancient Mariner. It’s amazing to think that distant evening, when Coleridge was walking along the Somerset coast witnessing the upper air burst into life, would inspire others as we once again prepare for showers. 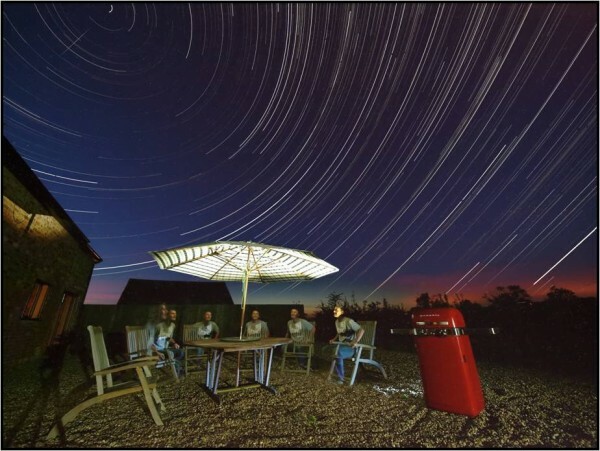 Whilst there are many displays throughout the year, the most visible meteor shower is the Perseids which light up the skies around mid August each year and offer peak shows of more than 1 meteor every minute – a perfect viewing event. The moon cycle can invariably weaken the viewing event (depending on phase) but even so the challenge of course is not necessarily to witness but to capture on camera. With this in mind, let us look at some useful pointers which will help camera owners increase their odds of pulling off a meteoric masterpiece over the coming weeks. Firstly, what Camera Equipment is required? Let’s not pull any punches. To capture a decent meteor image will require a good quality camera. Shooting a subject in low light or darkness will require a camera that allows full manual control of the settings and interchangeable lenses. In this respect a dslr fits the bill perfectly. Talking of lenses, my ideal selection would a choice of two (or both). A wide angle, something in the range of *7-14mm (14-28mm 35mm equivalent) together with a lens to get a bit closer, such as the *12-60mm (24-120mm 35mm equivalent). I’ll talk about why I suggest these two lenses a bit later within the technique section. Another pre-requisite piece of equipment is a tripod. This will give stability for those long exposures, and prevent motion blurring. Finally, I would recommend using a cable release or remote method of triggering the camera shutter. Combined with a tripod for steadying this will minimise camera vibration – you would be surprised how much vibration is created by simply pressing the shutter release button with your finger! Camera Settings – It’s important not to forget our camera subject which is essentially a fast moving bright object visible for a very short period of time. Successfully capturing a meteor with a short exposure time, in darkness, is near on impossible because timing will be down to luck (extremely low odds) and the foreground (for wide angle shots) will be too dark. In this respect, and to increase our odds of a successful capture we need to use a long exposure time. To do this firstly set the camera to manual mode (M). Now set the exposure time to between 15s and 30s (15s for continuous and 30s for single shooting – I will explain this more in the technique section) and shutter speed to the lowest setting (a good quality lens should get down to F2.8). Set the ISO to 500. This will be good starting point for most cameras. Bear in mind that camera systems and models vary tremendously depending on the technology inside, such as the sensor and processing engine. Personally, I have found 15s-30s is sufficient to capture the duration of a single meteor. Combined with a mid value ISO of around 500 will provide sufficient light to deliver a pleasing image of both foreground and subject whilst keeping noise (grainy effect) to a minimum. Camera Technique. I must reinforce the fact there is a great element of luck in capturing a meteor on camera. One can advise on the optimum camera equipment and settings but there is never any guarantee of success. The key is not success but rather improving ones odds of success. I can certainly increase your odds and results by using the following techniques, based around lens choice. Firstly and desirably find a location away from populated areas and light pollution. Set up the camera with a Wide Angle Lens and try to position an on object in the foreground, such as a tree or man made structure. This will add perspective or scale to an image. Position the camera/lens to cover the north east skyline keeping a small portion of land in the bottom third or quarter of the frame. Ensure focus is set manually to infinity. Using a 15s exposure time and remote cable (set to lock) pop the camera into sequence shooting and hit the shutter release button (If you don’t have a remote cable simply keep the finger pressed on the shutter release button, although it will get numb quickly!). This effectively primes the camera to take continuous frames until you switch the camera off (or the battery runs out). What you will end up with here is as many (or little) images as desired and which can be imported into stacking software. A final composite image could be as long as the night combining a star trail effect with hopefully a meteor or two. If using this technique a good tip, to improve composition, is choose a foreground subject with something of interest and paint it with light. This can be done simply by setting off a few rounds of flash remotely whilst the camera is shooting or waving a lit torch around the foreground. Pros – Excellent success rate of meteor capture with good image composition. Cons – Captured meteors will appear small, with little detail against a wide angle frame. The second technique involves using a lens with greater focal length or Zoom. The far end of a mid level zoom range would suffice (60mm or 120mm 35mm equivalent) or, if available, a high end zoom lens allowing anything up to 200/300mm (400/600mm 35mm equivalent). Once again manually set the focus to infinity and use a 30s exposure time. Train the camera/lens on an area of sky alone and fire away as and when you feel. To start, concentrate on an area of north-east sky near the Perseids radiant (see Perseids section) but do vary the location all around the sky. 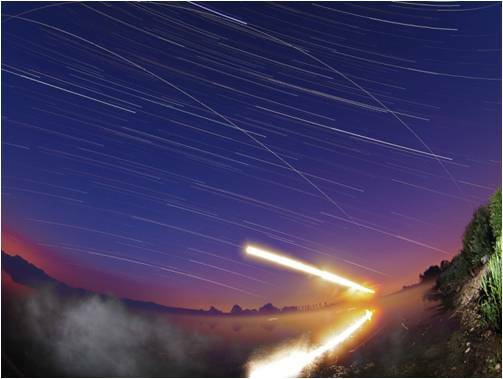 Pros – Captured meteors will fill the frame with great detail (and colour). In addition, do experiment by adopting the 15s continuous shooting technique with a zoom lens. This will also increase capture odds. Personally, I shoot with two cameras using both these techniques to really maximise the odds of capture, composition and detail. The Perseids are meteors which appear to originate from a point within the constellation of Perseus in the north-eastern sky. This point, known as the shower’s radiant is a good starting point for aiming the camera lens. Do note that one might see a meteor anywhere in the sky but the direction of motion, when traced back, will point to the radiant. A meteor that does not point back to the known radiant for a given shower is not considered part of that shower. Locating the Perseids’ radiant is very simple and situated in the constellation Perseus, just below the familiar ‘W’ of the constellation of Cassiopeia. Finally, it is worth making a quick point about Iridium Flares. Sometimes it is hard to tell the difference between an Iridium flare and a meteor. (See top photo). Iridium Flares are common communication satellites which illuminate when the sun reflects off their bright antennas. Usually the brightness, colour and trajectory are a giveaway (noticeably brighter in the center and dimmer at its ends). Iridium flares can also be accurately predicted (http://www.heavens-above.com) and which is the best indicator for confirming, as long as you note the time, direction and elevation. May all you showers light up! 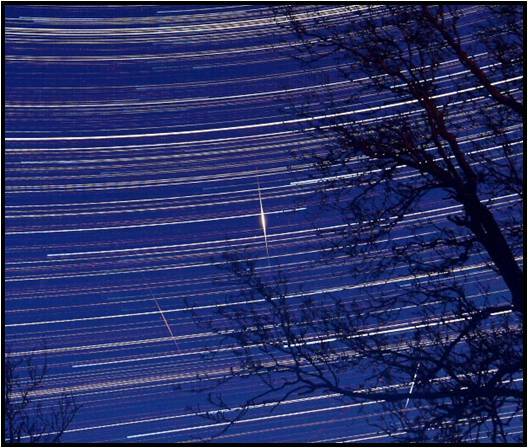 Between the 11th & 13th August the perseid meteor shower will once again be visible. This will peak on Friday night when you can expect to see many metors burn up in the upper atmosphere. Its an impressive sight, and one that you can not only see, but capture on your camera, in fact you can get some great shots with only an iPhone! To take full advantage of this app I would recommend getting your iPhone set up on a tripod. I have been using an adapted generic (cheap) car windscreen mobile phone holder. I sourced the correct sized nut and glued it to the holder. I can then attach it to any tripod, although normally use a jobby gorilla grip on it. These elements are all you need to use your iPhone to shoot great shots! This should work for the meteors.. I would also recommend you enable the Screen Shutter function that allows you to tap anywhere on the screen to take a shot.. This evening I decided to try some iPhone astrophotography. This blog post will let you see how I got on, and give you the info you need to get started yourself. While the iPhone 4 camera is far from ideal for astrophotography (the sensor is small compared with a DSLR; in fact it’s not even as good as most point and shoot cameras) it does have one distinct advantage – it’s usually very much to hand, just in my pocket in fact. There are two kinds of astrophotography you can do with an iPhone: with and without a telescope. The former is called afocal astrophotography, but it is the latter that I tried out tonight: just using the iPhone camera, some extra hardware, a 59p app, and a clear sky. You can also buy several apps that claim to allow you to take longer exposures, even letting you use a bulb setting (this isn’t actually possible with the iPhone shutter hardware – each of these apps is actually using a clever software work around, but you’re not getting a true 60 second exposure when you set your “shutter speed’ for 60 seconds). Both of these apps have a variety of software setting to allow you to get the best picture; tonight I used Magic Shutter with a 60s shutter speed. The main obstacle to taking long exposure shots with the iPhone (apart from the fact that the hardware won’t actually let you!) is that you need to make sure that the iPhone doesn’t move at all during the duration of the exposure, so holding it in place with your hand isn’t an option. Luckily there’s a great gadget available from a company call Magnilux. The device is called the Magnilux MX-1 Telescope Adaptor, which allows you to attach your iPhone to any telescope eyepiece. It also doubles as a tripod adaptor. Tonight I didn’t connect my iPhone to my telescope since my target, the International Space Station (ISS), moves so quickly and travels across such a large part of the sky that you need as wide a field as possible to catch it. 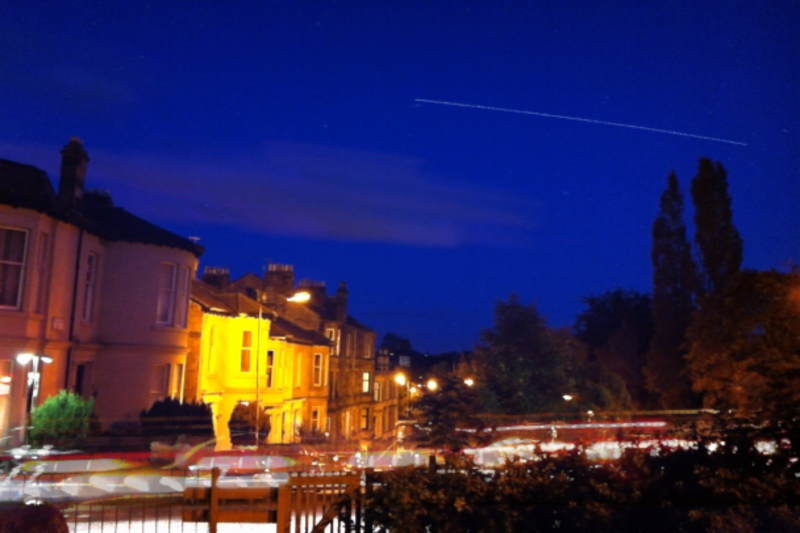 To capture the ISS you need a long exposure (use Magic Shutter app – see above). The pass tonight lasted 4’19?, and traveled 90° through the sky (from 254° WSW to 164° SSE). The iPhone 4 camera field of view is only 60.8° so I couldn’t capture the whole pass. 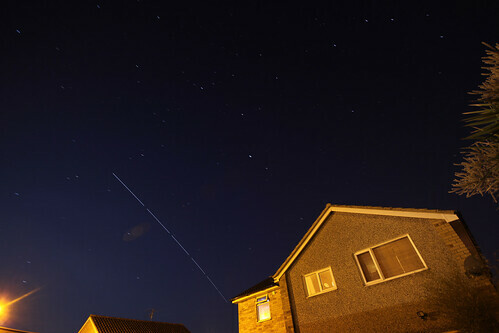 Instead I decided to try to capture a 60s exposure as the ISS rose to its highest and brightest, at 206° (SSW). With a 60? exposure, of course, I had to have my iPhone mounted to a tripod. I could have used the Magnilux MX-1 Adaptor set up for tripod mode (see above) but instead I opted to use my new Kungl iPhone case with built in tripod thread, which I attached directly to my tripod. Far from ideal, but not bad given (a) it was my first attempt, (b) I had one chance to take the image before the ISS faded from view, (c) the sky was very bright (this was taken at 2344 on 23 June 2011, just after midsummer, with the sky just out of civil twilight), (d) cars kept driving past (note the light art in the foreground!). Once the sky darkens again later in the year I hope to test this set up under a truly dark sky to see whether it can pick up sharp star images. I suspect that might be tricky! If anyone else has tried iPhone Astrophotography please let me know in the comments.